You can be a capitalist quaterback in the superbowl against socialism. Join the team. Defeat the sports-crazed socialists. Don't fumble the ball. Tell everyone "I am a team player, but I play for the better team." The score so far: LIBERTARIANS 23, SOCIALISTIC SPORTS NERDS 3. Stop Sports Welfare, Sports Taxes, Socialized Sports, Government Sports (Public Sports), Nationalized Sports, Government Sports franchises that turn the business of sports into socialism and bread and circuses. Learn how it is related to the authoritarian dogma of Edward Bellamy, Francis Bellamy and the Pledge of Allegiance. Sports welfare is reminder of similar government fanaticism and obsessive socialism under the Nat'l Socialist German Workers Party. It is disturbing to note that the flag fanaticism in football is similar to the early American flag fetishism that influenced the National Socialist German Workers Party (the Bucs death's head flag includes the same color scheme -black, red, white- of German National Socialism). It is the glorification of government games in contrived controversies of bread and circuses involving specially selected / imported men (many of whom have used steroids) who are cheered on and glorified as "supermen" by adoring fanatics in the media and the general population. The stadiums and the television scenes are intended to foster the same awe as that in Roman coliseum scenes (e.g. Ridley Scott's "Gladiator") and Leni Riefenstahl's "Trumph of the Will." It is the same attitude that the government has cultivated in the media and populace to support the contrived controviersies in its aggressive military socialism abroad which is also treated as never-ending games for child-like minds. It is fostered at a young age in government schools (socialist schools). Those who disagree give the same eerie rationalization given under the National Socialist German Workers Party: It is done with "good intentions" to boost public morale, to bring the community together, and to foster civic spirit. They have no idea that their rationalization is the same in EVERY authoritarian society. DAN RUTH - is he actually a socialistic sports nerd? Will he ever tell? GO SPORTS NERDS!!! FAR AWAY !!!! TICKET SCALPING - and socialized stadia. socialistic sports nerds turn morality & government on its head. SOCIALIZED FOOTBALL - the separation of sport & state is as important as the separation of school & state. 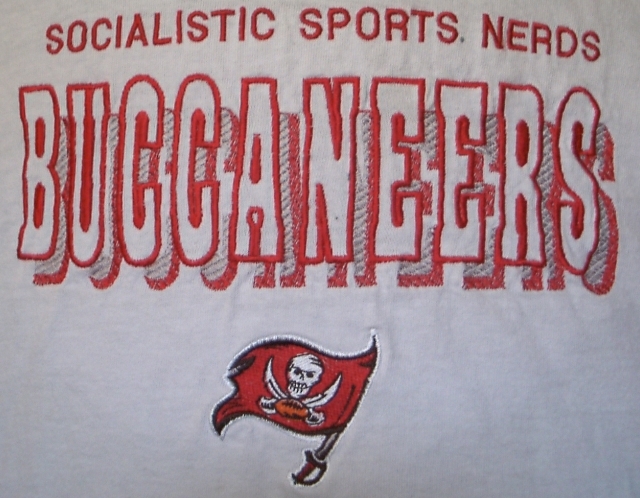 BUCS T-SHIRT - will this popular shirt help socialistic sports nerds think philosophically? probably not. THE OLYMPICS - T-Rex singlehandedly keeps the Glorious People's Olympics out of the Tampa Bay area. Seen on the web: If you went to see England college station soccer at Wembley, you could observe people around you making the Nazi salute during the national anthem, and abuse of black players, even those playing for the home. It is sad to note that it sounds like the USA not long after the Pledge of Allegiance was created in 1892. T-Rex's victories over Socialistic Sports Nerds & Their Fetish. GO SPORTS NERDS!!! FAR AWAY !!!! SPORTS HUMOR - socialistic sports nerds are hilarious. I just finished reading the article you did about the corrupt ways of blowhard Tom McEwen. Fascinating stuff, but hardly surpassing. In the few times I actually wrote to his weekly "Hey Tom" column, he refused to print my letters. I suspected a huge ego at the time and I was young. Now I am grown and completely understand the man had more power than most knew. He couldn't have gotten away with his slanted views if he didn't. Now I know why. Thanks for making it all clear and a special thank you for finally playing a part in taking that man out of my life for good. He was a complete waste of space and time. RexCurry.net is the originator of the libertarian phrase "socialistic sports nerds" that describes and condemns fanatics who support taxes and government in sports. On October 6, 2003, a google search for the quoted phrase "socialistic sports nerds" and "socialistic sports nerd." There were about twenty hits on both the web and on newsgroups, and they were all attributed to RexCurry.net. The oldest reference was from 1997. The catchphrase helps explain this axiom: If they support socialism for sports entertainment, then they will support socialism for anything. The separation of sport and state is as important as the separation of church and state. Newspapers often rhapsodize the lives of sports "greats." Never has any sports hero repeatedly and publicly denounced government involvement in sports. If they support socialism for sports entertainment then they will support socialism for ANYTHING. Socialistic sports nerds engage in emotional masturbation similar to that in the Pledge of Allegiance. Both forms of emotional masturbation were acquired in government schools (socialist schools). The Pledge was created by a self-described socialist who supported "military socialism." He wanted all of society to ape the military. 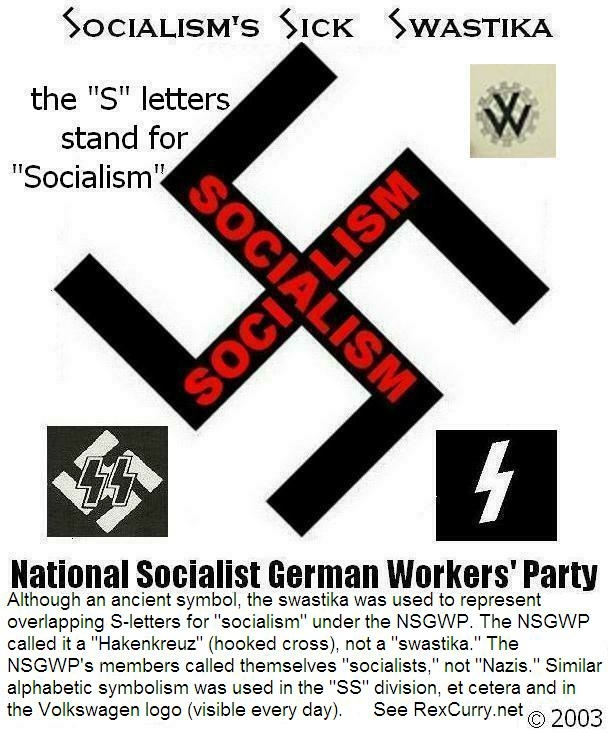 The National Socialist German Workers' Party was influenced by America's Pledge of Allegiance, its military socialism, and by American football games. Today, there are even football teams that represent branches of the military and their cadets. A recent Army-Navy game included cut-away shots to soldiers in a foreign country in the current war in which the President is being beaten and humiliated. The soldiers were cheering for their respective football "teams." The war that the soldiers had been forced to fight in had many parallels to the football game that they were watching and to all NFL cities and NFL games. Most socialistic sports nerds are Democrat-socialists or Republican-socialists. No one expects Democrat-socialists or Republican-socialists to act on principle. When either "team" controls both houses of Congress (and/or the presidency) fanatical behavior occurs. Blind team loyalty brought six years of unbridled growth in the federal government's size and scope under Republican-socialists. Blind team loyalty in sports brings new taxes for socialized stadiums and discrimination against all other sports. The old political parties are bizarre. Understanding the world, though rewarding, provides nothing like the pleasures of a "Two Minute Hate," a focused, ritualized denunciation of enemies. To induce its own Two Minute Hates, the old parties, like Ingsoc in 1984, manufacture bogeymen such as "special interests," "judicial activists," "so-called realists," or "moral relativists" that become symbolic representations of detested outsiders. Meanwhile, like the Inner Party in 1984, the leaders in the old parties tolerate the more vulgar, angry purveyors of ideology -think talk-show hosts or authors of bestselling political books. The most vicious attacks, meanwhile, are reserved for turncoats, like Goldstein in 1984. (Of course, as many old party members could attest, the hatred is usually mutual.) Rooting for dogma is as engrossing to its partisans as rooting for the local football team is to its fans. People like a good war like they like a good football game. But they forget the score of last year's game and don't appreciate past performance. So they'll forget last year's war just as easily EXCEPT if it drags on. The American people like a war that we're not clearly winning and that drags on about as much as they like a football game in which their team is not winning that drags on past dinnertime. They don't appreciate such a war any more than they appreciate such a football game. Politicians thought they were bringing the American people a good thing by waging war in the middle east. You can be a capitalist quaterback in the superbowl against socialism. Join the team. The score so far: LIBERTARIANS 23, SOCIALISTIC SPORTS NERDS 3. Defeat the sports-crazed socialists. Don't fumble the ball. Tell everyone "I am a team player, but I play for the better team." 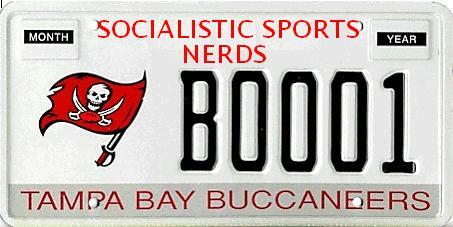 Socialistic sports nerds are bad sports. Does Fandom Breed Establishment Loyalists? I love sports. So Michael writes to me and rants about the ridiculously fanatical fan fever for sports teams and how that annoys him. He believes sports fervor is a form of nationalism that breeds loyalty to the establishment. I can certainly sympathize with his point. But I've always thought that the bizarre notion of American school spirit is a form of quasi-nationalism, if you will. It seems to breed similar loyalty on a larger scale as these types typically come to worship the state as much as their alma mater. Going to a small, private college, I've always disliked the extremist college fervor from alumni that has them worshipping everything about their former place of "learning." At 50 years old, college is still the one thing they want to talk about all the time. I used to be forced to go out to lunch with my audit team when I was working in public accounting and working out of the office on client audits. (Team-building, don't you know.) There were two main topics of conversation that sprang forth from these otherwise intelligent, educated people: TV shows and college (alma mater) worship. It drove me nuts. Nowadays, if people do that in my company, I just start surfing the web on my Palm Smartphone. Talking about the good old days at college as if they were the only days. Seems a bit bizarre to me. SPORTS FANS TAKE TO HEART THE SLOGAN: "If you can't be an athlete, then be an athletic supporter." If some Guy in an R Jersey runs into traffic and gets hit by a car ... how is it that another Guy donning a D Jersey is NOT going to get hit while running into the SAME traffic? Stop Sports Welfare, Sports Taxes, Socialized Sports, Government Sports (Public Sports), Nationalized Sports, Government Sports franchises that turn the business of sports into socialism and bread and circuses. Learn how it is related to the authoritarian dogma of Edward Bellamy, Francis Bellamy and the Pledge of Allegiance. 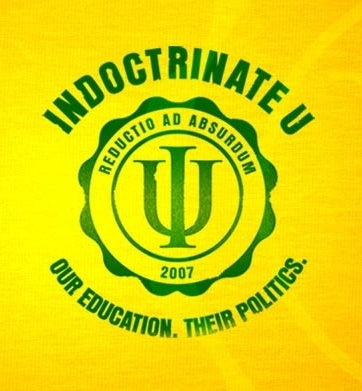 It results from indoctrination in government re-education camps (government schools / socialist schools). The Bellamys wanted the government to takeover all schools to end individuality and liberty and to impose "equality" by making everyone the same: robotic, chanting and obedient. The Bellamys promoted discrimination against activities that the government did not select and impose through government schools. Sports are an example of how the government selects entertainment for everyone and discriminates against other sports / desires by stealing money (taxes) and redirecting the stolen funds toward socialized stadiums for government-approved sports. It gives a frightenting meaning to the singing of the National Anthem at sporting events in socialized stadiums. It gives a frightening factualness to the term "sports fan" (short for "fanatic").